In a 1906 report on education in Alberta the following items where recorded for Gleichen. The principal was A.M. Cronkhite who had a 1st class certificate and was paid $900 per year for his services, this can be compared with the average pay of $1200 per year. The school had three other teachers. Of the students 8 were writing exams for a class V diploma and 2 where writing for a class VI diploma. Of the 103 students on an average day 77.04 were in attendance. This worked out according to the report as an average attendance of 74.79%. This compared very favorably with the provincial average of 55% attendance and Gleichen had the highest attendance rate. The next closest school was Coleman with 69.77%. Three rural schools where built that were associated (and administrated out of) the Gleichen school; Hammerhill, Dana and Craigantaler. Also Gleichen was commented on because it had a substantial school building which had just received a modern heating and ventilating system. 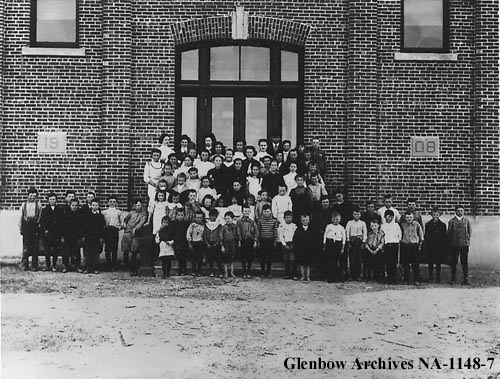 The Glenbow has several school photos of the children at the Gleichen School. The first is dated 1911 and has no information on who is in the picture. The students are listed as: Front, l-r: Mae Thacker; Nellie Murney; Jessie Thacker; Pearl Musner. Back, l-r: Robert Thacker; William Thacker; A.N. Renaud; F.S. Joy. 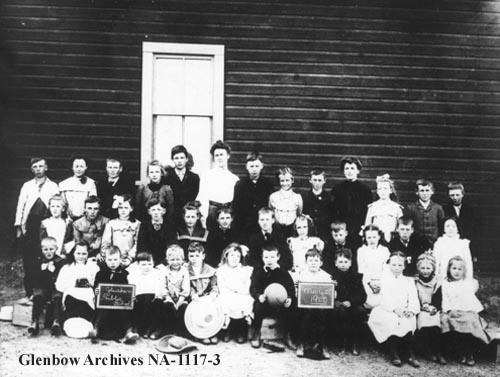 There is an almost complete identification of the students in the May 21, 1905 school class photo for the Gleichen School. The Glenbow identifies the students as: L-R back row: W. Service; Mary Lawson; Bill Wingfield; Agnes Service; Vern McNeil; Miss Annie McEwen; Earl Shouldice; Hortense Snowden; Fred Jones; Bernice McEwen; Kathleen Craig; Clarence Markle. L-R middle row: L. Service; Wes McEwen; Millie Shouldice; Jimmie McBain; Del Sibbald; Andy Lang; Jack Wingfield; Alice Griesbach; Donald McBain; Maggie Wishart; Charlie Wingfield; Pearl McCann. L-R front row: Jack Service; Lucy Wishart; Harry Wingfield; Victor Beaupre; Norman Craig; Wilfred McDougall; Laura Roster; Chester case; Joe Marshall; Les Brerton; Esther Wishart; unknown; Irene McNeil. 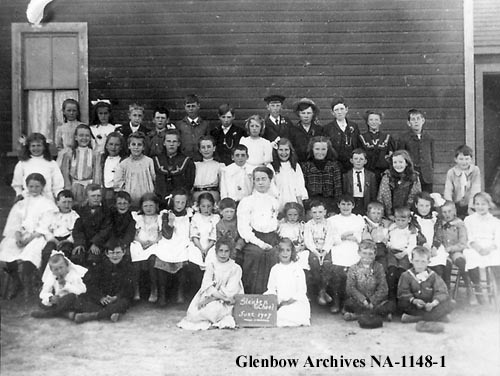 The 1907 (June 1st) class photo from the Glenbow has most of the children identified. L-R back row: Ishbel Gooderham; Edith Jones; Eric Dickinson; George Wakefield; Alec Buckley; Duncan McBean; Jean Gooderham; Billy Service; Joe Telford; J. Mcbean; Leila Service; Rod Gooderham. L-R third row: unknown; Kathleen Craig; Unknown; unknown; Agnes Service; Kate Gooderham; Jo Wakefield; Hazel MacPhee; Bessie Telford; Joe Marshall; Florence Telford; Clarence Evens. L-R second row: Florence Wishart; unknown; Jack McBean; Austin Allen; Unknown; miss Telford; Lucy Marshall; Rip Hunter; Miss Cook (teacher); Rosie Service; Vic Beapre; Grace MacPhee; Harry Landells; Unknown; Mabel Telford; Jimmie Service; Irene McNeill. L-R front row: unknown; Isaac Allen; Ruth Buckley; Queenie Wakefield; Walter James; Frank Cosgrave. 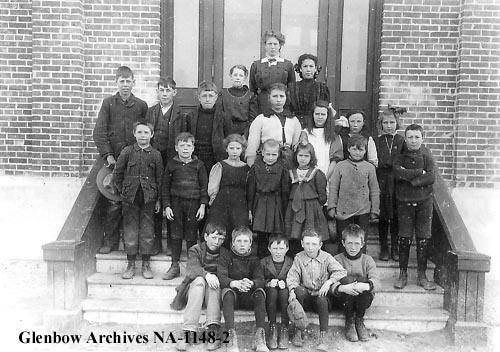 The 1909 class photo shows the children on the front steps of the school. The Glenbow identifies the people in the picture as: L-R back row: Edith Wilson, teacher; Lucy Arial. L-R third row: Alec Buckley; Rod Gooderham; Eric Dickinson; Jean Gooderham; Florence Telford; Ethel Telford; Nida Trego. L-R second row: Austin Allen; unknown; Rosie Service; unknown; May Jones; unknown; A. Arial. L-R front row: Meshick Naylor; Jimmie Service; Charlie Jones; Harry Landells; Frank Cosgrave. There is also a 1909 full school photo but with no identification attached. 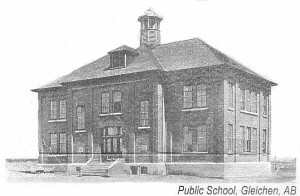 The 1911 version of the Gazetteer has multiple pages of businesses listed and says that Gleichen is a fine community since it has a ‘completely equipped school for its educational progress. A September 28th, 1921 article from the Gleichen Call gives the results of which children won which prizes in the school fair. An article from 1920 talks about the various competitions engaged in during the 1920 fair and how many local schools competed. The 1920 fair had 47 craft/skill competitions and 35 sporting competitions; 12 local schools sent competitors and the grand prize of best in show was a brand new camera donated by A.R. Gates of Gleichen. In the 47 craft categories the first place prizes ran from $1.50 to $5 (best heifer). For examples of what a $1.50 would buy you in 1920 look here. 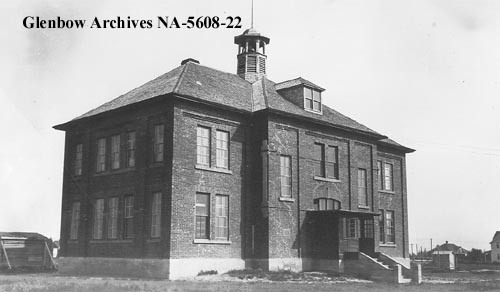 In 1922 the Agriculture college in Gleichen was closed after only a 2 year operation. 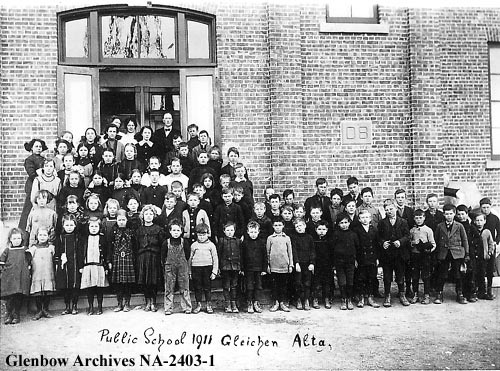 This was one of three agriculture schools opened in 1920 by the Government of Alberta and all three had very short lives, historians have given many different reasons for the failure of this school including economic depression in the 20’s among farms; but the most widely recognized source for the failure was when the UFA was elected to be Alberta’s government in 1921. The newly elected UFA government shut down the ‘Board of Agricultural Education’ the loss of the co-coordinating body left the Gleichen, Youngstown and Raymond colleges with no support after only a year of operation each. In 1972 Old Sun College was founded as a joint venture between the Sikisika Nation and Mount Royal College out of Calgary. 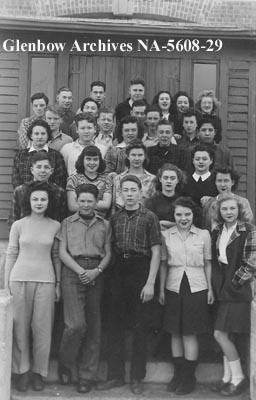 The high school class in 1946 has a photo in the Glenbow archives. 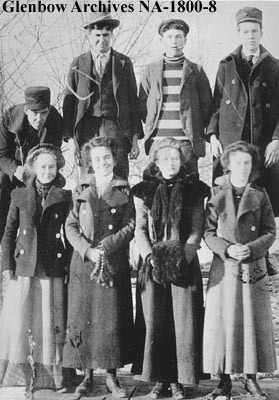 The students are identified as: Front row, L-R: Pat Rogowski, Dale Hunter, Don Hunter, Doreen Bechtold, Pauline Rouche; second row, L-R: Beverley Boarding, Louise McKay, Olga Sookachef, Beverley McMann, Pauline Sutermeister, Ethel Bates; Third row, L-R: Lydia Litke, Frank McKay, Ethel Bogstie, Ted James, Norman Calf Child; fourth row, L-R: Buddy McKay, Stewart Anderson, Bobby Service, Donna McCallum;, fifth row, L-R: Bill Phythian, Percy Yellowfly, Allan Rodominski; sixth row, L-R: Snooky Matheson, Lloyd Riddell, Tommy Kalmoakoff, Joy Sutermeister, Joy McQueen, Elly Jensen. 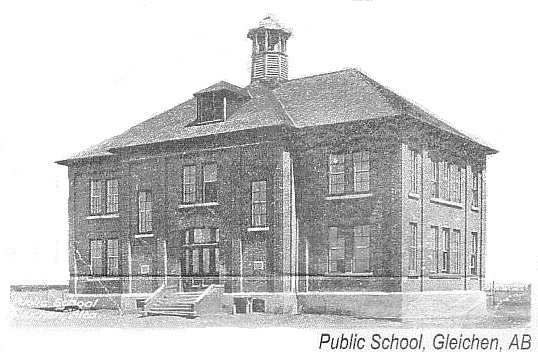 A 1950 report called Provincial Facts and Figures had the following information on Gleichen: 142 Students where enrolled in the Gleichen school which included a High School. For information on the Sequoia Outreach School look here. The school is still in Gleichen but the new one is supposed to be opening this fall outside Standard. Art just passed away. You were well before my time in Gleichen, some of your age should still be around. The Gleichen Call is on line,it may have photos.